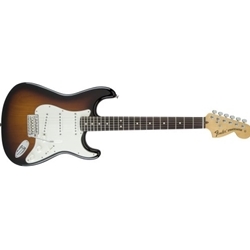 Fender's American Special Stratocaster solidbody electric guitar gives you popular Strat features at a price that's nearly unheard of for a US-made Fender. It all starts with an alder body for classic Strat spank, and it's all wrapped up in a great-looking gloss urethane finish. The Fender trademark maple neck feels great with its Modern C profile, and jumbo frets make for fast and precise fretwork. In the tone department, a trio of Texas Special single-coils dish out the chime while a vintage-style trem deals with the whammy action. You're going to love the Fender American Special Stratocaster. You're sure to cut through the mix, thanks to a trio of Fender's Texas Special single-coils. Used in any one of the five possible switch positions, the pickups give you classic Fender tones that have been with us since the dawn of the Strat. But these pickups have a little something extra that sets the American Special Strat apart from previous Strat incarnations - a Greasebucket tone circuit and vintage-style tremolo round out the features on this beauty. If you're looking for an American-made Strat with unbeatable bang for the buck, it's the American Special Stratocaster! American-made quality at an unbeatable price!